Falcon is a new online editor for basic image and text editing from Aviary. It has usual markup editing options but with exception of being super quick (its hardly 90k and loads very quickly in your web browser). Nothing to download, install and even register or login. Just open Falcon in your web browser and perform basic image editing on the fly without too much fuss. It has neat interface with basic tools on the left side and color, effects tools on the right side. To get started you can upload image from computer, enter web URL or start drawing on blank canvas. You can crop, rotate and resize images quickly using this online app. 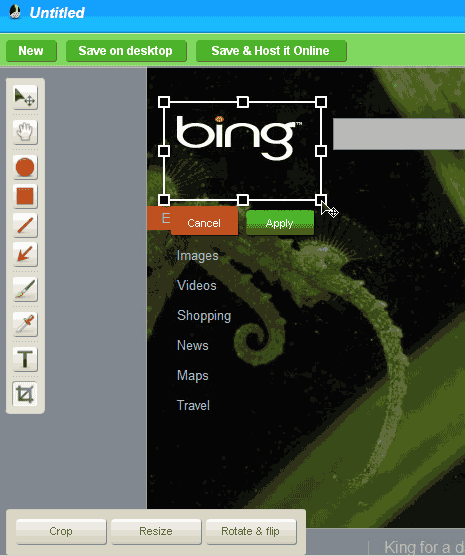 It also allows you to add those jazzy arrows, rectangles, text and doodles on any image. You can adjust colors, outlines and size of images on the fly. Checkout Aviary Falcon for basic editing within browser at blazing speed (it is really quick, impressed!). Here is official video pitch, music can get over you!